The property has recently undergone significant improvements by our clients who have installed a delightful modern and contemporary feel using high quality fixtures and fittings. The property is entered into a spacious entrance hallway which provides access to the entry level accommodation. There are also two staircases, heading both to the first floor and to the ground floor accommodation. The impressive sitting room is of great proportions and features a large bay window offering outstanding views over the formal front garden towards the countryside in the distance. Within the sitting room is a wall mounted glass fronted contemporary remote controlled inset gas fire providing a central focal point of the room. Beyond the sitting room is the superb kitchen / dining room loosely divided into two areas. The kitchen itself has been fitted in a contemporary style with high gloss white base and wall mounted units with Corian work surfaces and matching upstands. All modern appliances have been catered for including double oven and induction hob, integrated dishwasher, fridge and freezer. There is also a generous bank of fitted cupboards at one end of this room with swing out larder. There are French doors within this delightful room leading to the rear sun terrace and gardens. At first floor level there are three bedrooms and a family bathroom. The master bedroom, located at the front of the property, is of a generous size with two large windows offering delightful views across the front gardens as well as flooding the bedroom with ample natural light. The master bedroom provides en suite shower room facilities. Two further bedrooms are located at the rear of the property and overlook the rear gardens and grounds. Completing the accommodation on this level is a well equipped family bathroom with L-shaped bath with shower over. On the ground floor there are two further bedrooms and a door which leads to the integral double garage. One of the bedrooms on this level is being used by our clients as a home office and has an external door leading to the rear gardens. The integral double garage contains a utility area as well as houses the boiler. This area could be converted into additional accommodation if required, subject to the necessary permissions required. 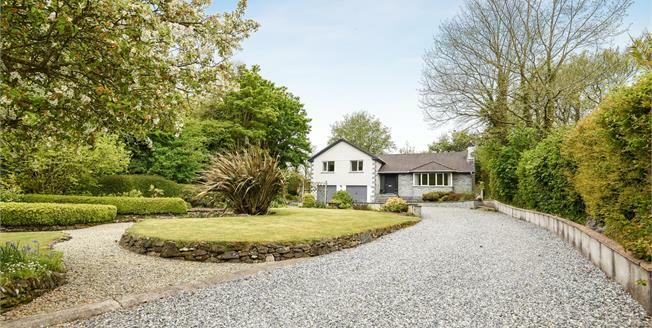 Externally the property is approached via a long private gravelled driveway leading to the parking area immediately in front of the property and garaging. The formal front garden has been extremely well manicured and houses a mature range of plants and shrubs. The boundary is defined by a stream to one side which makes a wonderful additional to the setting. The rear gardens again have been extremely well cared for and have been segmented into various areas ranging from a small orchard, vegetable plot and formal lawned gardens. To one side of the garden is a raised sun terrace which houses an impressive summer house which has electric and Wi-Fi. Within the gardens there are various external power sockets.